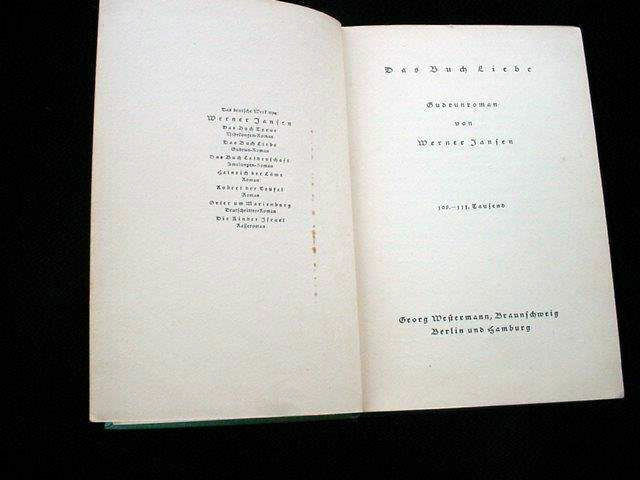 DESCRIPTION: The book is by Werner Jansen and is titled Das Buch Liebe published by Georg Westermann in Braunschweig with copyright date of 1920. It comprises 304 pages. 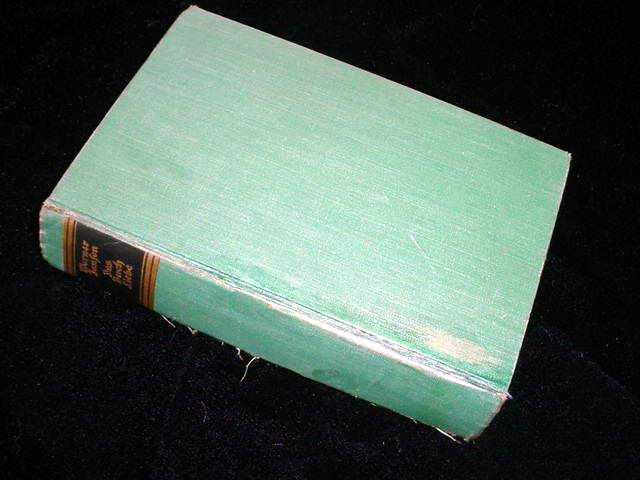 The cover is in green cloth with gilt title on the spine, and a small tear on the edge of the spine (fixable! ); otherwise, fine. 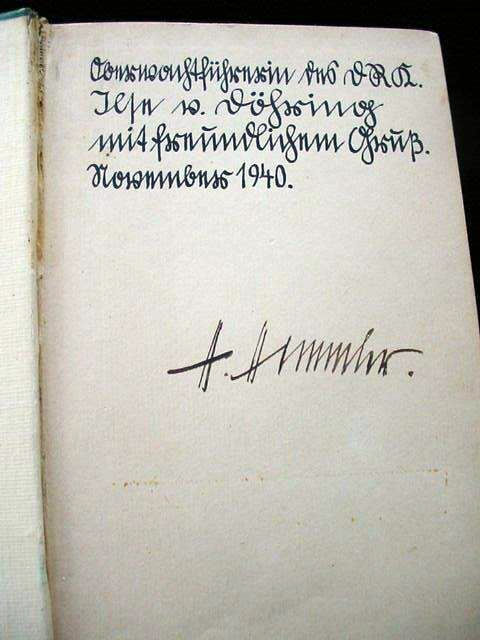 This is a presentation to Heinrich Himmler, inscribed to him on the front flyleaf with: “Oberwachtführer of the Rote Kreuz (Red Cross) Ilse Doehring with friendly greetings November 1940.” Beneath this Himmler has added his ownership signature: “H. Himmler.” This epic saga was dedicated to young women whose men were at the front during WWI. 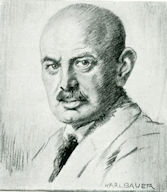 The author, Werner Jensen, and this work were very dear to Himmler’s heart in 1924. 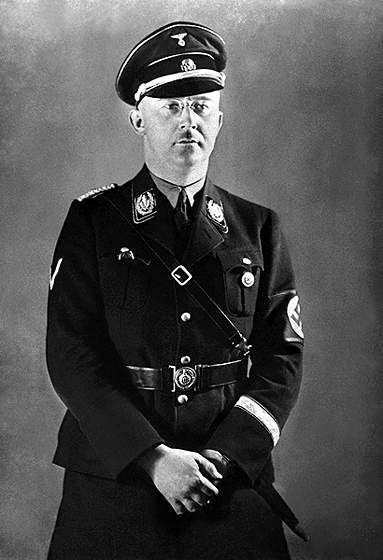 After first reading it Himmler declared this book, “. . . the songs of songs to the Nordic woman.” He said, “This is the ideal image we Germans dream of in our youth and are ready to die for as men.” (‘Very good’ and historically important to the extreme.) 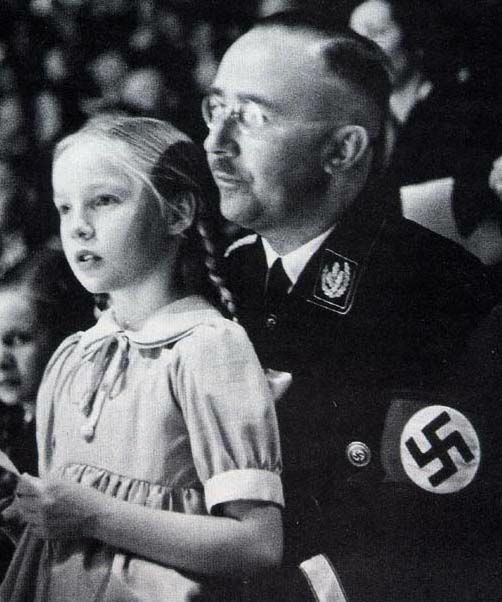 It shows the obvious sentimentality of the Reichsführer-SS. 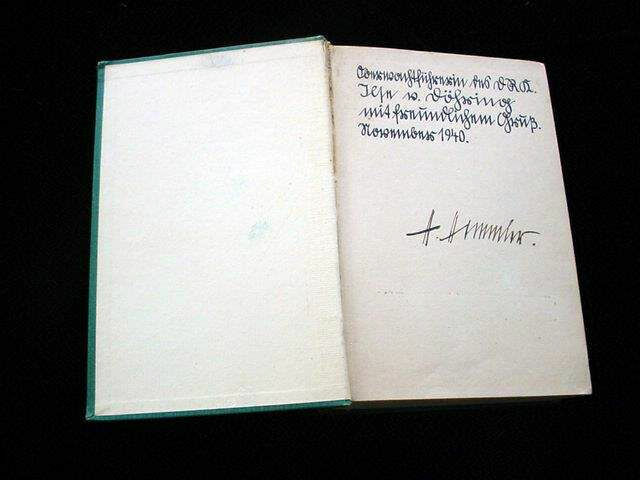 This is not only revealing, but Himmler's signature is one of the boldest and best of his that we have ever seen. He was obviously proud to own this book. PRICE: $1,700.00 VERY RESONABLE FOR SUCH AN IMPORTANT HISTORICAL FIND! 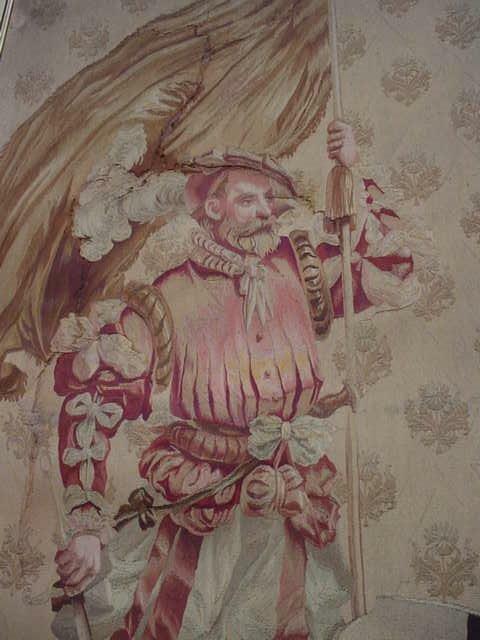 DESCRIPTION: These two fantastic hand-woven tapestries once graced the walls of the Berchtesgaden Bavarian home of the man that Adolf Hitler called his mentor; this was Dietrich Eckart (1868-1923). 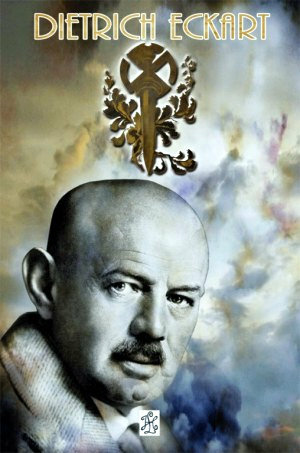 Eckart began his career as a journalist and poet. He blamed his earlier lack of success on the Jews and Marxists. 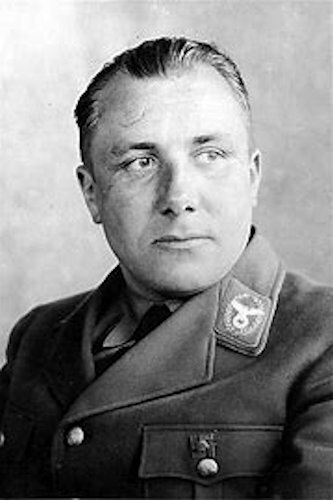 He also blamed the socialists for Germany’s defeat in WWI and in 1918, entered politics and created one of his several poems—the battle cry “Deutschland Erwache!” (“Germany Awake!”). 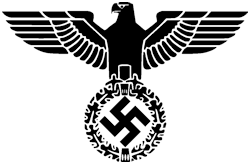 Eckart was an early member of the German Workers’ Party that evolved into the National Socialist Workers’ Party (Nazi Party). He began a close friendship with Adolf Hitler and introduced the awkward, young politician to the “right” people in Munich. 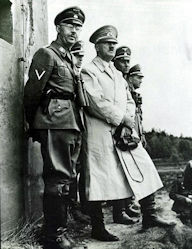 He also encouraged Hitler in his political agendas and nationalist aspirations. Eckart’s “Storm Song” was the oldest national hymn of the N.S. Party. 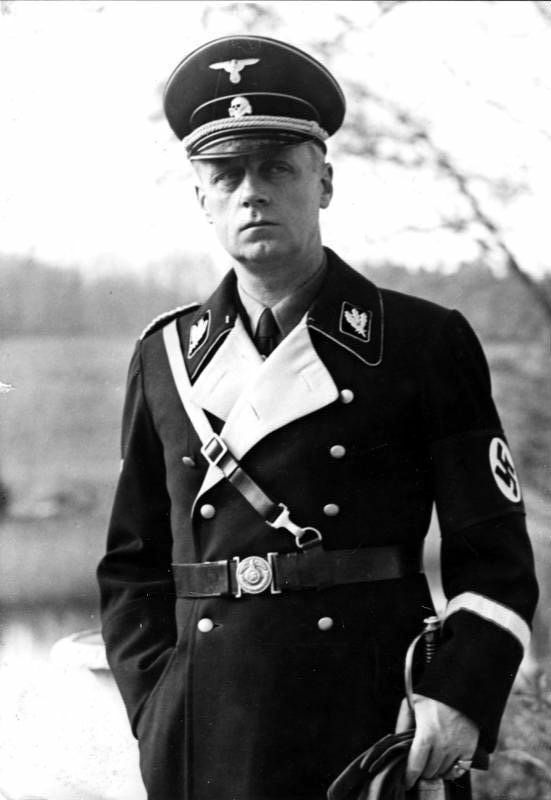 In a pamphlet published shortly before his death, Eckart hailed Hitler as the man who would reveal the whole conspiracy of the left. (He often said that Moses was the first Bolshevist.) 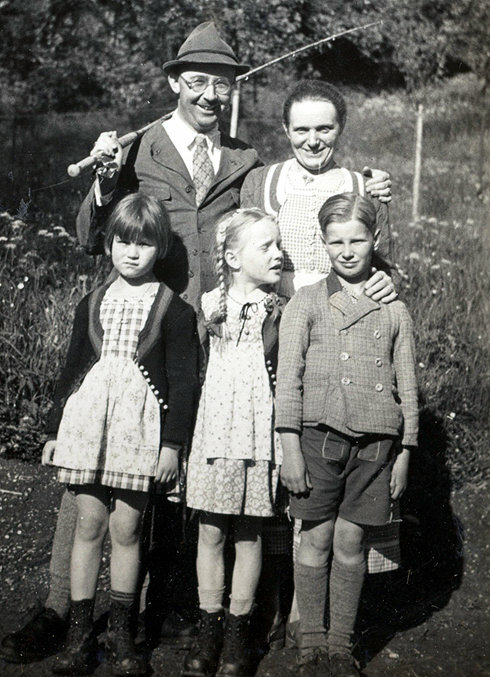 Eckart was in essence the father of the N.S. 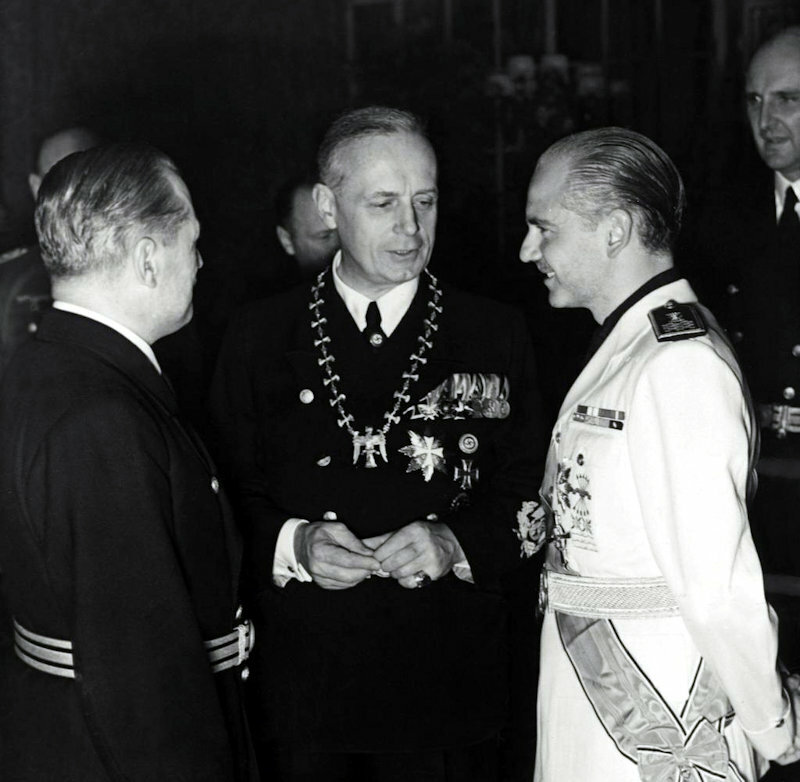 Party and for a time he did “awaken” the Germans—they listened to him; at least in Munich, Haupstadt der Bewegung,” (Capital of the Movement) and after Hitler had made his mark, that city and all of Germany listened to Eckart’s protégé. 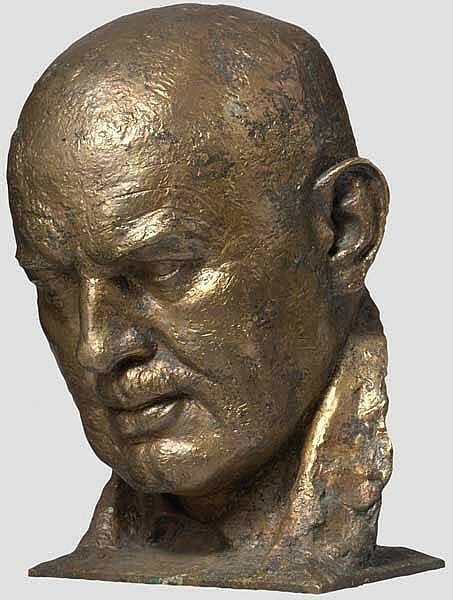 Information passed to us from German historian sources lead us to believe that Herr Eckart was a lover of the arts. We do know that he was independently wealthy and enjoyed the art and music of the Germanic peoples throughout the ages. He loved and strongly identified with Henrik Ibsen’s Peer Gynt. 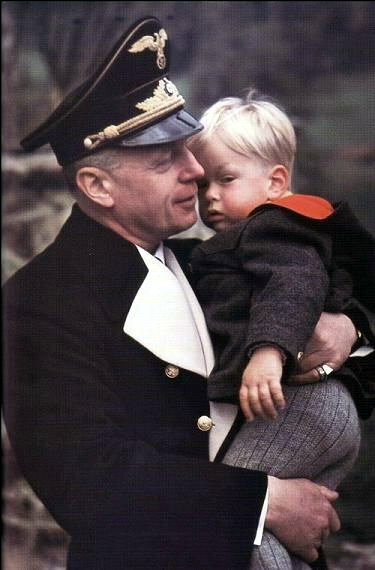 His father was a royal notary and law counselor in Nuremberg and was independently wealthy. The father was a collector of the finest in objects d’art. 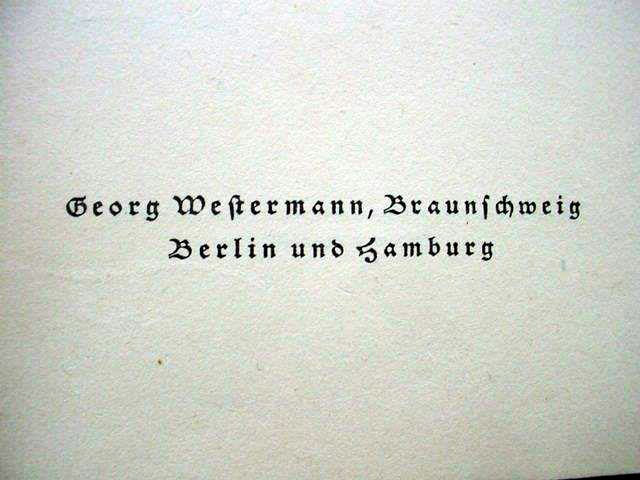 Dietrich became a playwright in Berlin under the tutelage of Georg Graf von Hülsen–Haeseler. 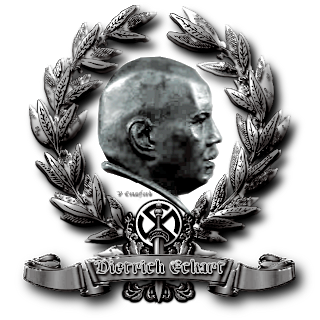 During this time Dietrich developed an ideology of what has to be termed “genius” (higher human strata) at one point based on earlier writings by Lanz von Liebenfes. He joined the Thule Society in 1913 and became politically active in 1915. 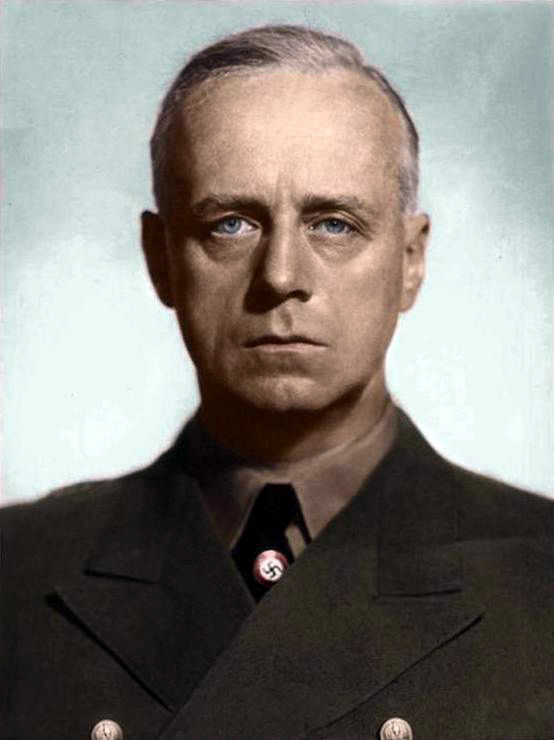 He wrote the nationalist play “Heinrich der Hohenstauffe” (“Heinrich of the High Baptism”) in which he postulated a claim to world leadership for the German people. Much more about this man of destiny can be Googled, but please read between the lines. Political correctness does have a way with defamation. 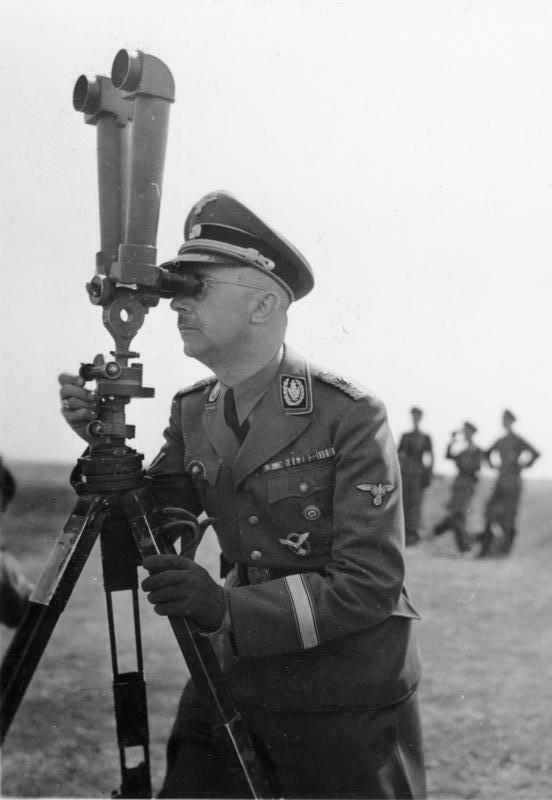 This was the man to whom Hitler dedicated the first volume of Mein Kampf. During all of this fantastic and colorful career he was known to have strong interests in the collecting of Germanic art, a favorite subject in which he indulged himself. There were various art objects that depicted German warriors: from the fighting men like Arminius the Liberator (commonly called “Hermann”) who defeated Roman legions in the Battle of the Teutoberg Forest in the year 9 A.D., to Frederick Barbarossa’s knights. But, especially, he adored the stories of the Germanic Landsknechte, the colorful mercenary soldiers who had a formidable reputation and were to become an important professional warlike force through the late fifteenth and sixteenth centuries. 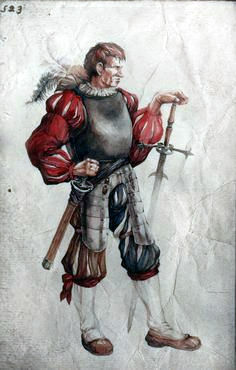 They consisted predominantly of German mercenary pikemen and supporting foot soldiers and they achieved the reputation for being the best universal soldiers for hire in early modern Europe. Landsknechte typically came from Swabia, Alsace, Tyrol, and the Rhineland. 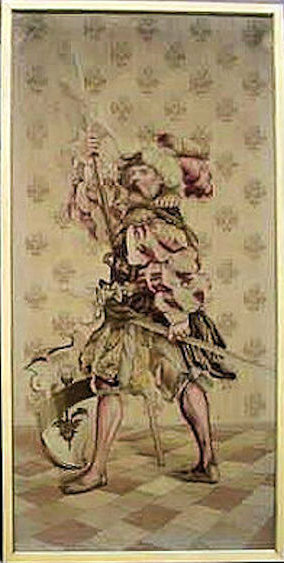 These two magnificent tapestries depicting typical German Landsknecht soldiers were taken from the villa of Dietrich Eckart in Berchtesgaden by an agent enlisted by the OSS, which eventually became the CIA. 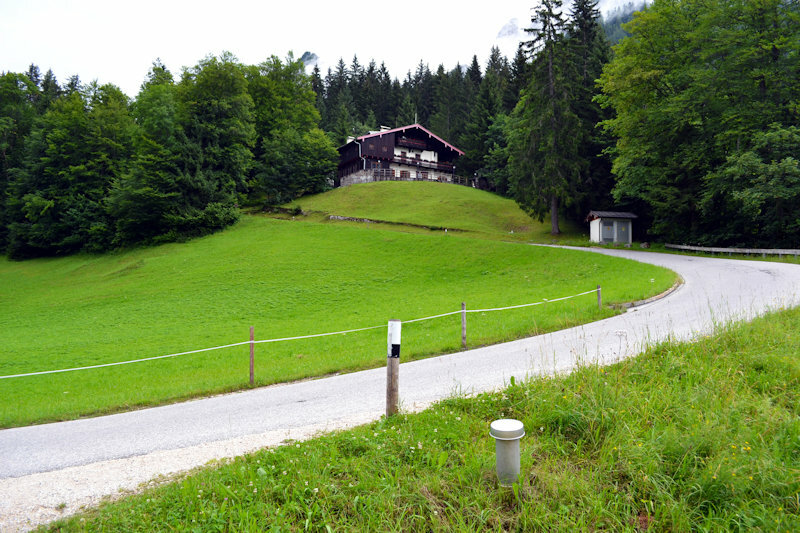 Locals in that picturesque Bavarian community tell us that this particular house is still in use by the CIA. We cannot offer any educated backup knowledge of this, but that is the rumor. This has been an incredible journey indeed and our information was supplied by the son of the now-deceased operative. We did not receive the tapestries from this man, but after we bought them from an antique dealer, we showed them in a private antique show. The son of this OSS official saw them and immediately approached us and identified the pieces as the very ones that his father had in his possession and later sold. 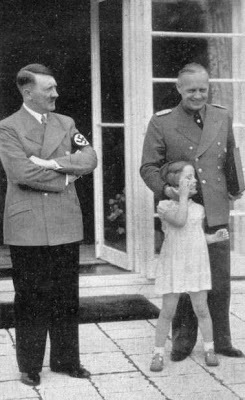 The older gentleman had not even known at first that this was the house of Hitler’s mentor until he was filled in by senior staff officers who had such knowledge. There is no doubt whatever as to the location of the house, and it is well known to historians; I have seen it myself as have other military historians. 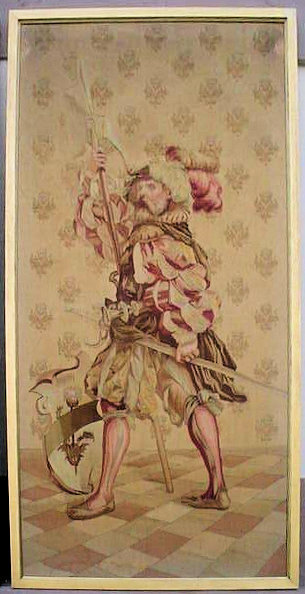 It is still there: a very nice little Landhaus from which came these magnificent Landsknectsoldaten tapestries. The tapestries are rather large, and measured from inside the frame they are 5 feet x 2 1/2 feet. The frames are 1 ¼ inches wide and are what we would call “OK!” These magnificent European art objects deserve more elaborate framing and I am sure when the right collector or institution acquires them this might well be accomplished. When they were “liberated,” we believe they were in elegant frames, or so we are told, but because of the nature of the moment of “acquisition” the frames had to remain behind at the villa. As you can obviously see, the tapestries are still showing the incredible artwork used in their wonderful production and were, of course, hand produced using the weaving art form known as petit point, the finest woven art the world has ever seen. The normal way that human figures were done was by needle point. To accomplish anything like these two tapestries in petit-point weaving would be infinitely more difficult and in subjects as large as these would be a labor so arduous so as it would seem absolutely impossible. Certainly it could not and would not be accomplished today. 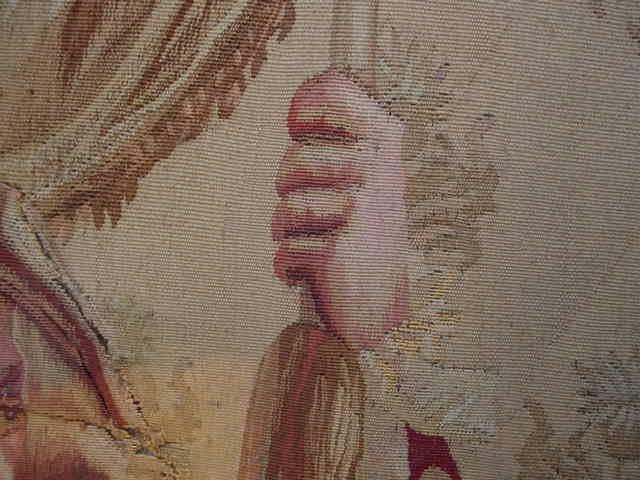 We ask that you would just imagine the length of time, the considerable amount of years it would take to weave these two tapestries all by hand. If there would be a glimmer of doubt that this was entirely (Handarbeit) “handwork” one can look at the back and see where even the smallest detail is separately tied off by hand and again this is incredible petit point. The work is many times more tedious to do than needlepoint. Even If it had been the larger weave it still would have been worthy of museum display. Petit-point works are so extremely rare—especially when of antiquity. Most are in museums and in many cases they are considered national treasures. I believe these could and should fall into that category. 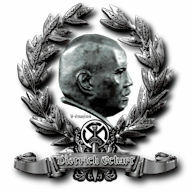 It is certain that Herr Eckart did! The soldiers are just as elaborately ornamental as you could possibly imagine. They have a unique three-dimensional effect. 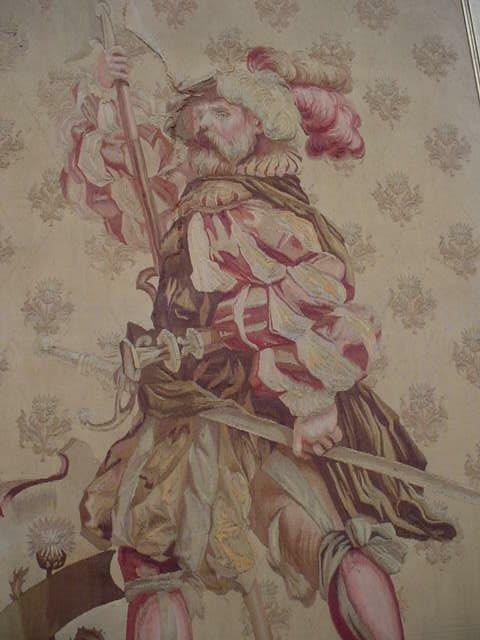 The embellishments are ornately superb and the artist was very knowledgeable of the Landsknecht costuming, weaponry, and historical presence. No European museum curator could possibly portray these tough mercenary fighters better. The soldier on the right holds a pike that was the initial weapon of these cadres (pikemen). 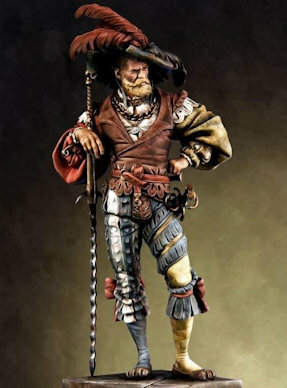 He also has the great two-handed sword that has come to be known worldwide as the Landsknecht sword, “Zweihänder.” He also wears the short sword known as the Katzbalger. 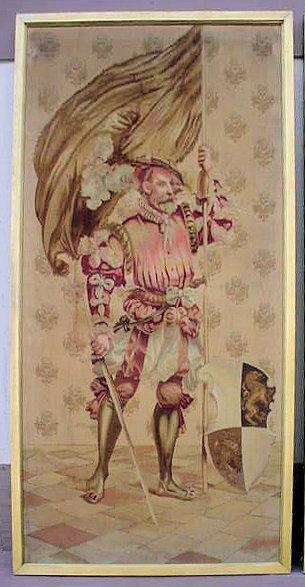 Beside him is seen a shield that depicts a mountain flower. Actually this same flower is seen in over 70 depictions in the background of the tapestries each one hand woven individually into the entire scheme. The figure on the left has a rapier (heavy sword), and he wears in his belt the Swiss-style mercenary dagger that is what the Nazi SA dagger was modeled after in the Third Reich. 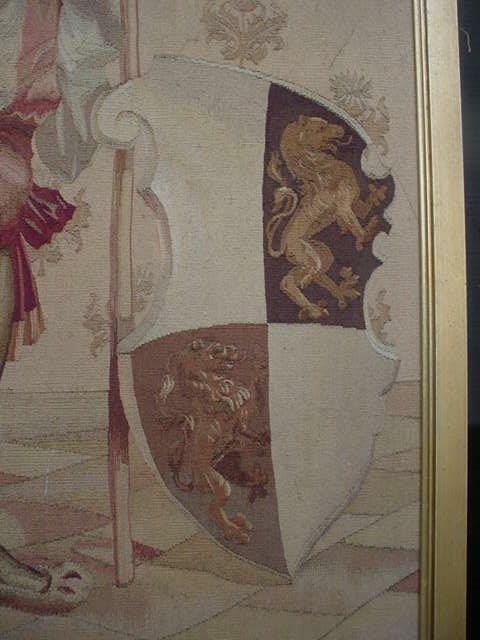 Beside him you can see a shield bearing two rampant lions. Both men are dressed in extremely exuberant costumes as Landsknechts always wore. It was the historical signature of the mercenary profession in that turbulent time. It seemed to be the rule that if a soldier was very handsomely attired, the more he had a genuine appeal to those who sought to hire him. We must note that these artworks are very handsome to an exceedingly intense degree and surely are without a doubt two distinct treasures of the Western world. Now comes the rather disappointing part. After these two tapestries were framed and set to be featured in a high-art auction, there came a time that they were sadly set in a place in the auction house where they shouldn’t have been. This was inexcusable and one tapestry was actually lying on top of the other and then tragedy struck! There was a large paper tarp placed over them to keep them clean and their being in that location was to be very temporary, but in the hectic goings-on there on that day, along came a stock attendant and seeing the white paper he thought it to be a table top and he placed an extremely heavy object right on top and needless to say this object plunged right through the precious tapestries like a knife through butter–tragic? Most certainly! Did they lose all value? NO! They still are what they are. Did they lose very significant value? YES! The reserve price of these fantastic items was simply astounding. The insurance settlement was even more than astounding. Later, we were offered them and after seeing them we just had to have them. Why? Because of all we have said about them in this essay we still truly feel they are extremely important historical items and possess sheer beauty and to us the fact that they were owned by one of German history’s most important and possibly most infamous individuals does give them some significant additional prestige. However, they do stand on their own as what I can only describe as masterpieces of the weaver’s art. The damage is very noticeable when looking at them close up and a more professional repair could make them fairly whole again, but it would necessitate finding an artist who would be able to duplicate the Old World skills and frankly we do not think anyone today would be in the least capable of this. (*Our opinion). 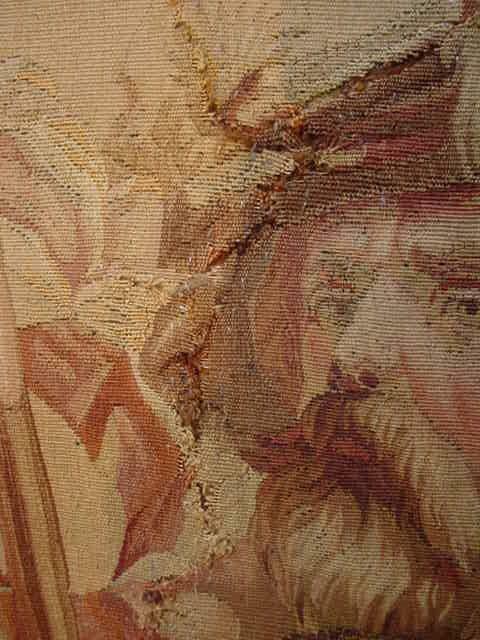 The damage is as follows: the tapestry on the right in our pictures has a gash from the bottom of the pike’s point and blade down to the hat of the man’s head and down along the outside area along the man’s face, but incredibly missing the face–thank goodness! It continues for a short distance along the sleeve of the costume. 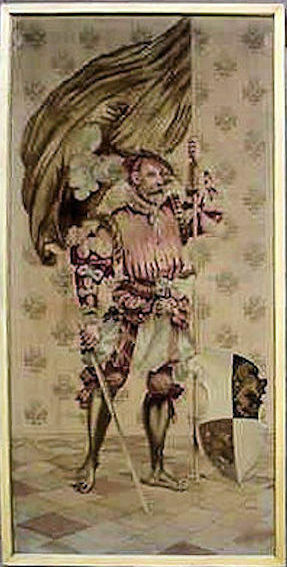 The gash on the figure on the left begins at the top of the banner and travels down through the ensign and then proceeds both right and left and then surrounds the large white hat plume and the Landsknecht hat and down to the pom-pom decoration in the center of the standard. After tracing along on the hat plume it travels about nine inches into the background and by some miracle it also missed the face. The repair that was attempted looks rather crude, but when one looks at the figures straight on, the repairs are not quickly noticeable. They are still of such a quality that any trained eye that will appreciate such excellence might just forgive their past misfortune. It is beyond incredible that the faces were missed in the horrid accident. Remember Venus de Milo is missing her arms and Nefertiti lost an eye, but they are still loved and adored. These tapestries will without a doubt end up being a prized display in a museum, someday. In the meantime, we enjoy the privilege of stewardship. Congratulations Dietrich Eckart for having owned them. Deutschland Erwache! 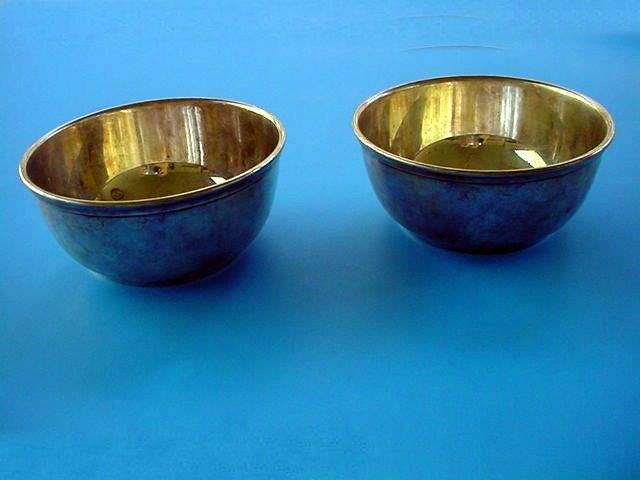 DESCRIPTION: The small bowls were “liberated” by GI’s and were part of a grouping gathered together and sold at auction several years ago. Bormann had the national political eagle on practically all of his tableware, glassware, etc. In this case, we see the proverbial handsome N.S. 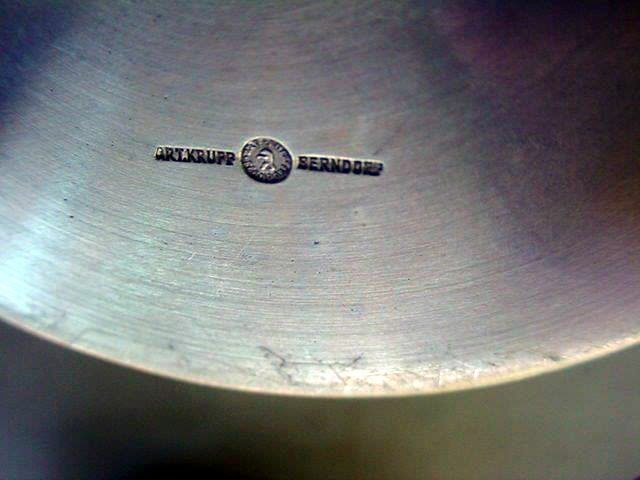 eagle beautifully stamped in the bottom of these Krupp bowls. 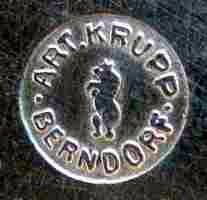 Bormann ordered them from the famed Krupp Berndorf factory with the “special feature” noted. They measure about 2 1/4 inches deep with a mouth opening of 5 inches. 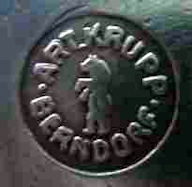 They are made of extra-high-quality silver plate (alpacca) and you can see here the Krupp marks as used in the National Socialist era. The items were probably used as some type of dessert bowls in either the reception studio or in the private study for complimentary nut or candy treats for guests. 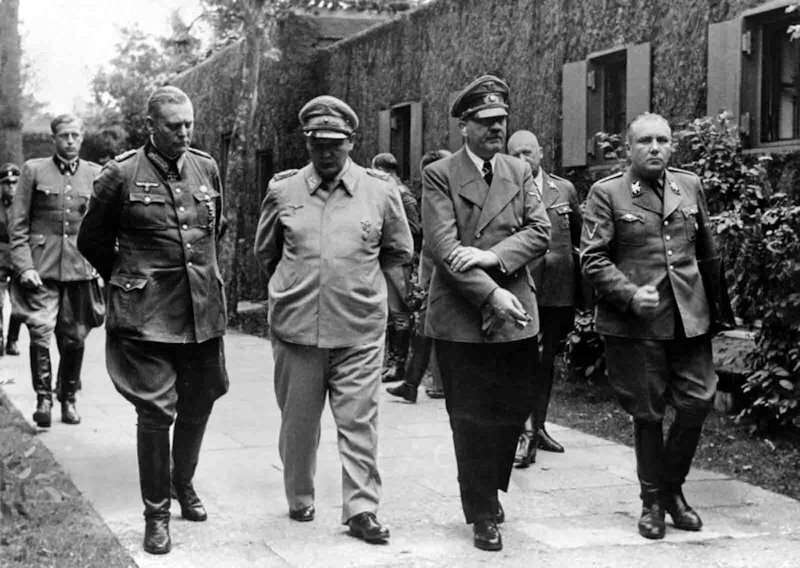 It has been said that Martin Bormann was a very gracious host and we know he was the absolute most able administrator of the party. 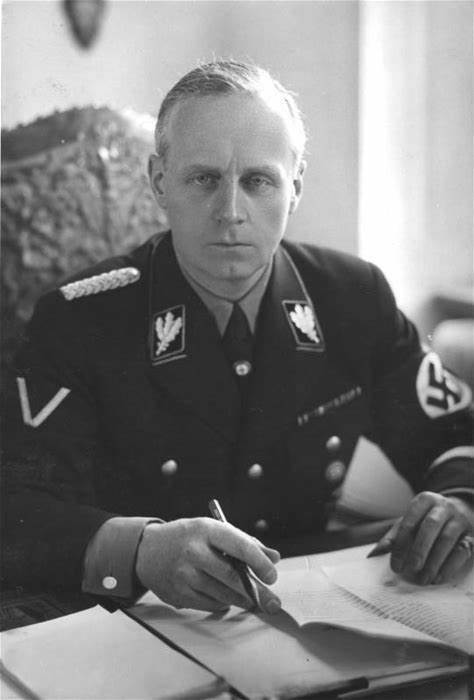 He was known as the “Brown Eminence“ in his role as the head of the party chancellery. 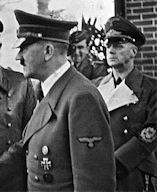 He was also the private secretary to Adolf Hitler and certainly, we know that he had significant influence in major decisions when advising the Führer. PRICE: $1,450.00; a great bargain! 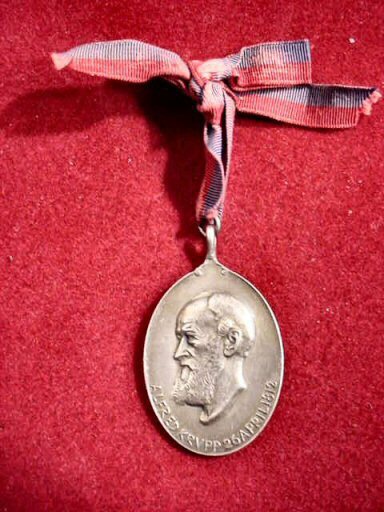 DESCRIPTION: This is a rare medal that celebrates 100 years of the Krupp dynasty from Alfred Krupp who was born in 1812 and died in 1887. He was known as the cannon king, or as “Alfred the Great,” from the time of Fredrich Krupp, 1787-1876. The family launched a small steel factory in Essen in 1811 to go on to become the greatest producer of weapons and ammunition the world has ever known. The medal struck in fine silver is oval in shape and is marked on the edge ‘990,’ the closest to ‘1000’ in pure silver that a medal could be. It has a good depiction of Alfred Krupp on the obverse, while on the reverse is the depiction of a muscular blacksmith with hammer, anvil, and a sword that he has forged. 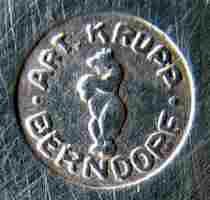 At the edges it says “1812 Alfred Krupp 1912. The ribbon is in the colors of the city of Essen. 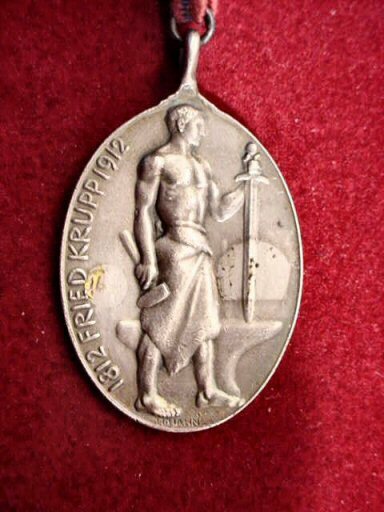 This large medal was presented during the centenary celebrations to Krupp’s leading customers plus important military and civil leaders. They are rare today as very few were struck and those that survive are in museum collections today. The medal measures 2 1/2 inches high. 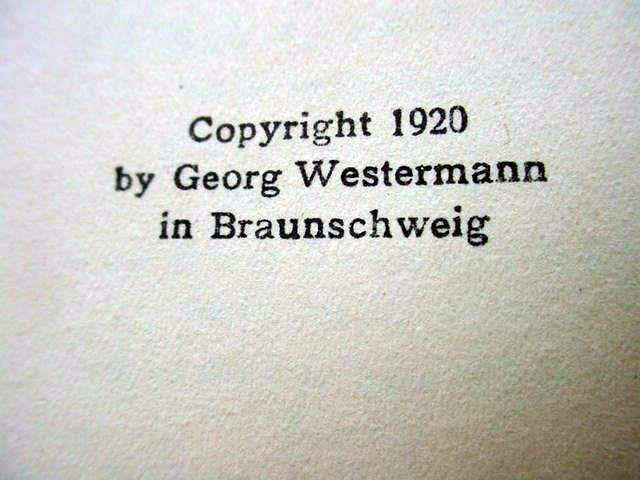 Note the "90" for silver content. 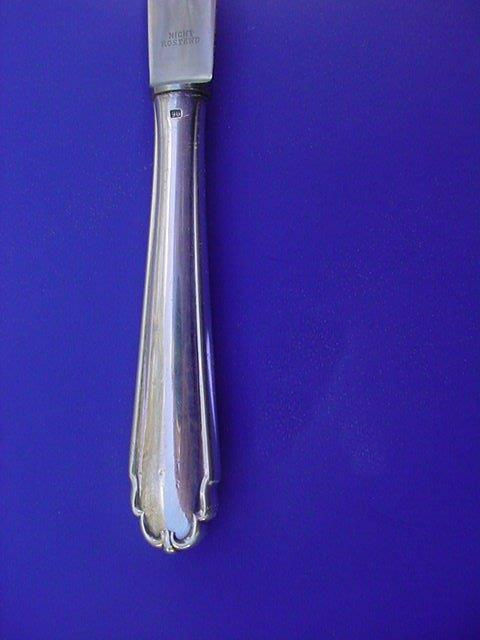 DESCRIPTION: This style flatware was the predecessor to the formal pattern AH flatware, but with subtle differences in the eagle and without the AH monogram. These pieces that we recently acquired are by Bruckmann. 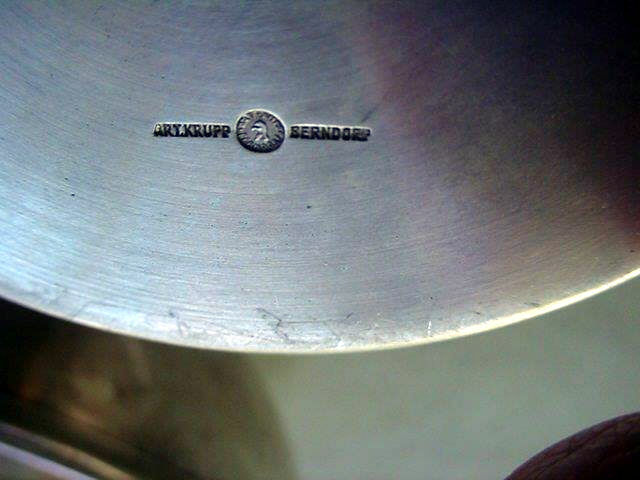 Occasionally, some of this particular flatware has been found by Gebrüder Sauerland, Berlin. 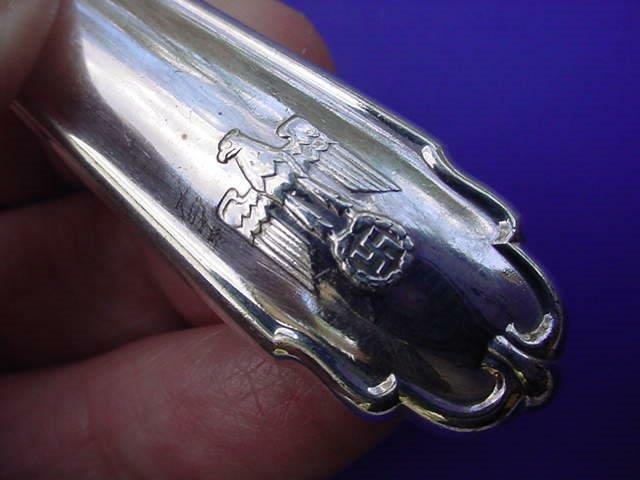 According to the book The Encyclopedia of Third Reich Tableware by James A. Yannes, this silverware was of the highest-level official service. 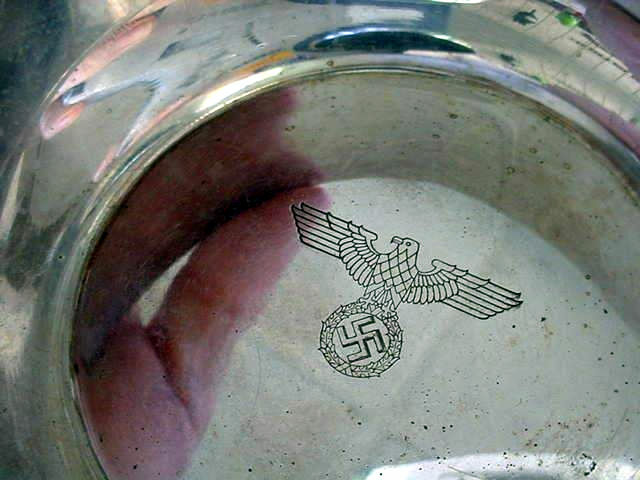 This pattern was not only used by Ribbentrop, but this was actually the official tableware used by the NSDAP official dinners and functions long before the “AH” and “RK” (Chancellery). The pieces today are truly rare and when found are hardly ever in the condition of these pieces we offer. 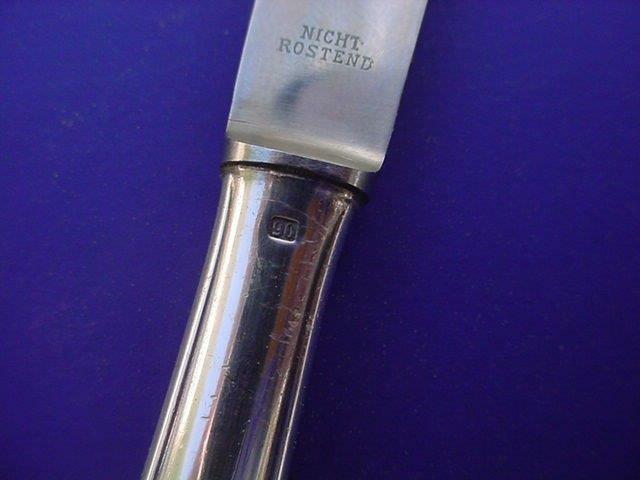 This set of knife, fork, and spoon are in practically mint condition having been in an important collection in Germany up until the present. It is comprised of three luncheon-sized utensils. This set is practically the only one in any condition at all comprised of the three essential luncheon utensils that we have ever seen in one group. We also have the dinner-sized set that came with the collection. Those will be shown below this article. Any other pieces of this group are the odd pieces and not shown as a set. Please inquire. 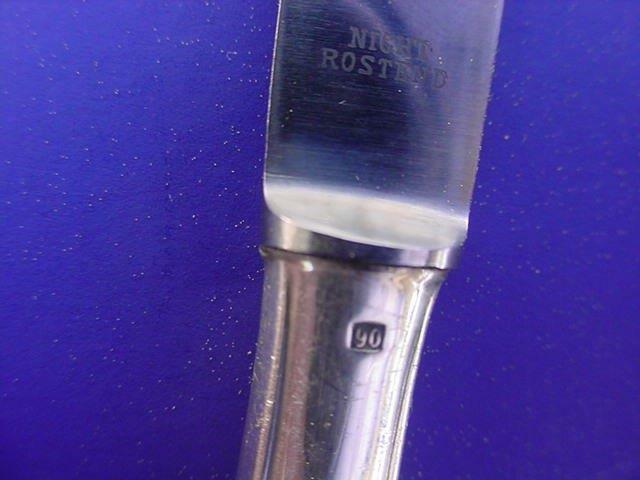 For measurements, the luncheon knife for instance is about 6½ inches long and the others are relative to it. 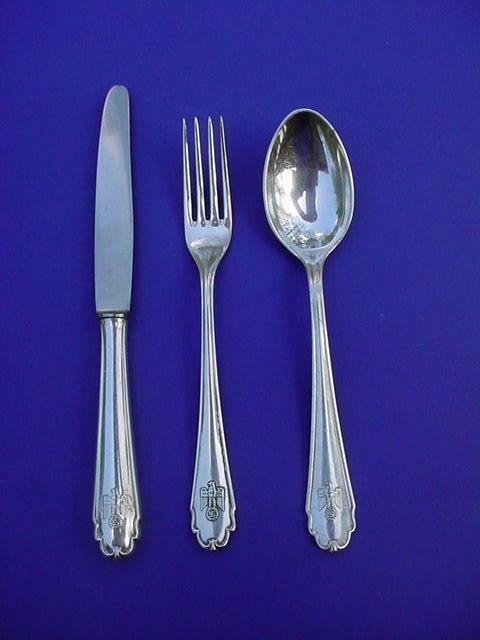 DESCRIPTION: As Hitler’s foreign affairs minister, Hitler and von Ribbentrop may have used these pristine flatware pieces as a special setting for the highest diplomatic dinners or functions. 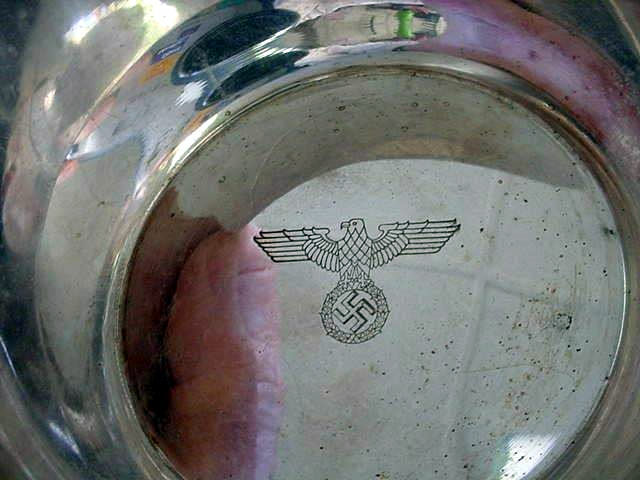 They actually were the predecessor of Hitler’s formal silverware. 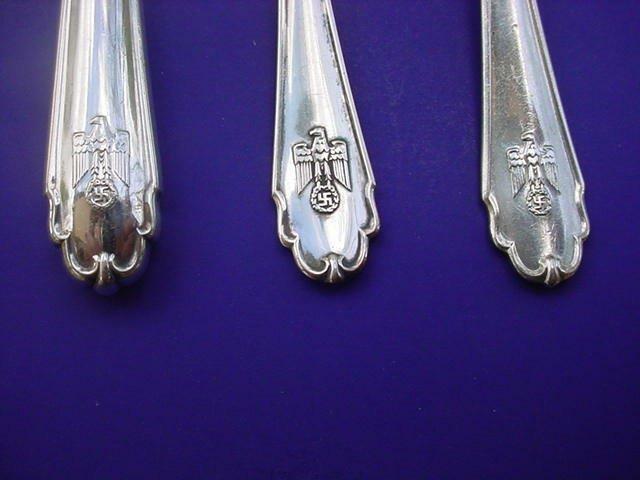 The eagle shown on the pieces is similar to the one used on the formal pattern AH flatware, but with subtle differences in the eagle and of course without the “AH” monogram. We have seen a piece or two of this pattern made by Gebrüder Sauerland, Berlin. 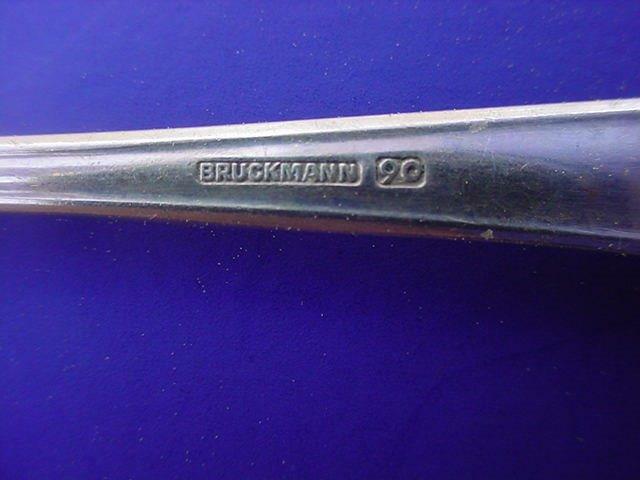 The pieces we offer are by Bruckmann, the most famous of the artists that patterned various pieces for the Führer. We are offering a three-piece set of knife, fork, and spoon in the dinner size—a little over 8 inches long. 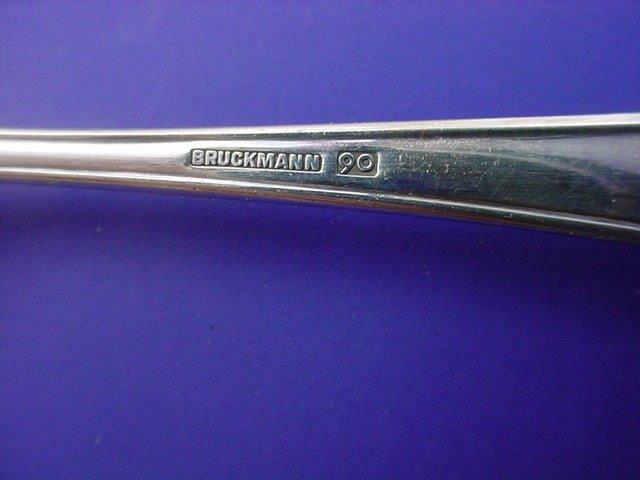 The sets were manufactured by Bruckmann in triple silver plate and marked "90" for plate. 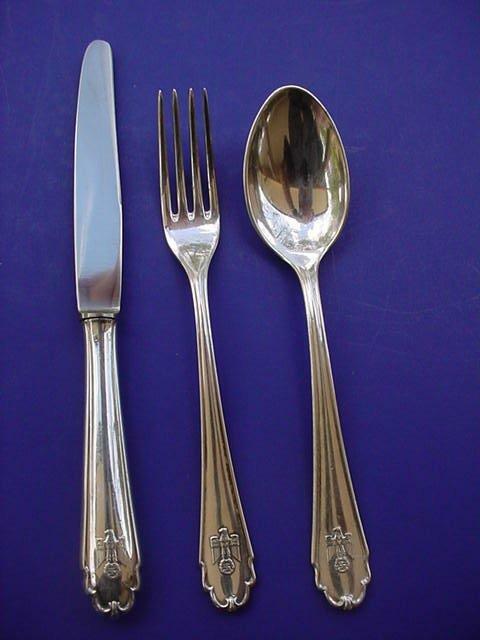 The three pieces seen here--knife, fork, and spoon--are in mint condition and were bought from out of a wonderful collection in Germany, recently. They were taken care of and housed in a controlled environment. These are quite rare, especially when found in a set such as this. 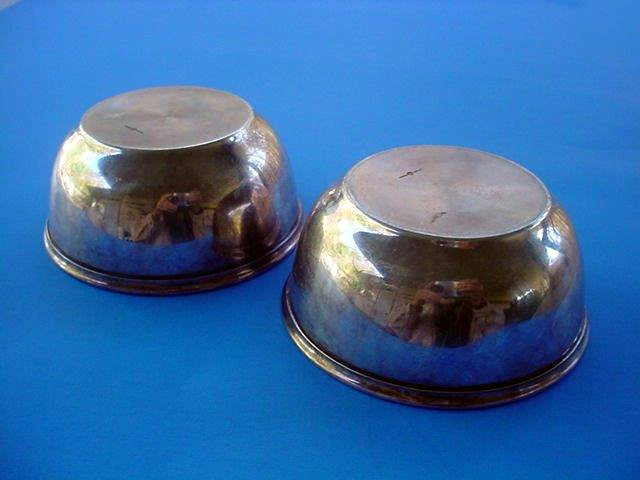 There are other matching pieces, but the only two sets are comprised of this one and the luncheon set seen above. 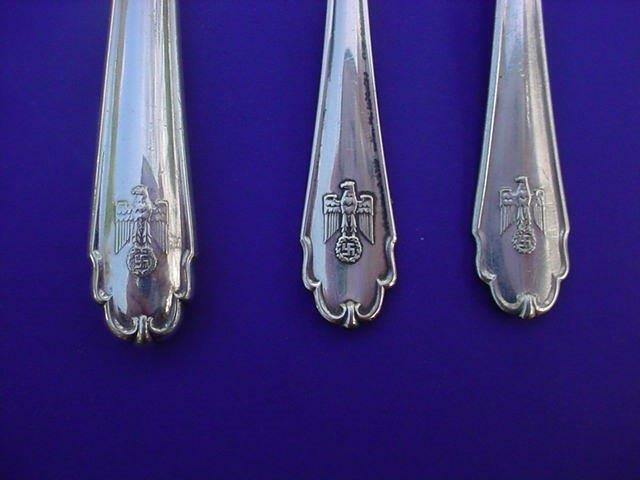 They are some of the prettiest of Third Reich flatware. 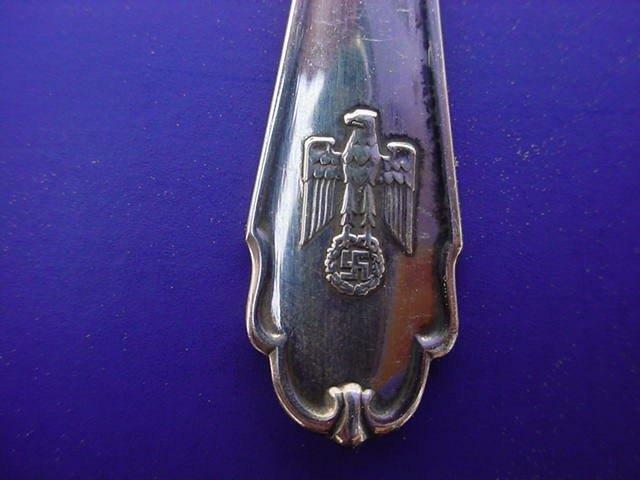 James A. Yannes in his book The Encyclopedia of Third Reich Tableware shows one piece by Sauerland on page 111; however, we know that Bruckmann pieces are much more desirable as he was the Führer’s personal silversmith.